You’ve sunk your heart and soul into building your business. With all that you’ve invested, you can’t afford to overlook anything, and that includes your online presence. If you’re not paying attention to your local ranking on Google, you could be seriously damaging your bottom line. Google uses a ranking algorithm of over 200 components, which they label as “signals.” These signals are used to determine which businesses or services appear at the top of the search results lists. With recent changes decreasing the number of local results from seven to only three, you’ll need to be paying more attention to your online presence now more than ever. The following is a list of 10 signals you should be aware of to help your business rank grow on Google. You can’t get away from keywords if you want your ranking to increase. Keywords are how people search the Internet. 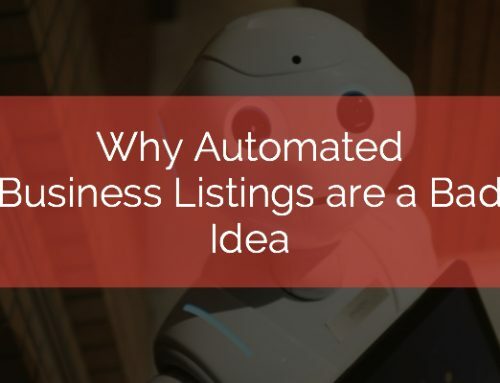 If you’re not using the right keywords—the keywords your customers would be using to find your business—you won’t be showing up at the top of the local listings, (or any results for that matter). Put yourself in your customers’ shoes and use the words they would use to find what they need. Keep in mind that jargon and professional terminology may not be your best bet. More often than not, your customers won’t be that familiar with specialized terms. Use basic language that everyone will understand. If you sell flux capacitors, delving into the depths of quantum physics åmay make you sound like an expert, but you can bet your customers won’t be searching those terms. They’ll be looking for simpler terms, like “time travel”. Now that doesn’t mean you can’t use your expansive and specialized vocabulary, just be aware that those terms won’t turn up the most results. While we’re talking about keywords, we should also mention the importance of being specific. This may sound contradictory to the previous point—how can you be specific without using industry-specific terminology? Admittedly, you’ll walk a fine line, but don’t settle for general terms. If you’re a baker, let people know what kind. Do you bake apple pies, or pizza pies? Those little details will help you more closely match what your customers are searching for. You should also be specific about local things. To boost your local ranking, talk about specific local events and news. Tie those topics into your articles and postings. Show your site visitor the role you play in the local community. 3. Google My Business and Bing Places for Business. listing. An agency can manage the listing, but only after the owner gives them the proper permissions. Second, you’ll need a physical address. If you don’t have a “brick-and-mortar” store front, don’t worry. There are options for service businesses that allow you to hide your physical address. When you do claim your listing, make sure to include as much information as possible, including address, logos, images, and descriptions. Filling out these pages completely with accurate information will help guide people to you and your business as well as helping to improve your ranking. One of the factors used in Google’s algorithm is prominence, or how well a business is known in an area. Google tries to compensate for offline prominence so that places that are well known locally, like museums or landmarks, appear on the lists. But Google also looks at how prominent business are online as well. That type of prominence is determined by looking to see if your business pops up across the web, like in links, articles, and directories. If other businesses are backlinking to your site or citing your content on their pages, then you increase your chances of appearing in local search results. The key to remember, however, is that you’re looking for quality, not quantity. Don’t blanket the entire community with requests to be included on their pages. A link on a daycare page to a local pawn shop is going to look fishy. Instead, start with your local Chamber of Commerce and Better Business Bureau and ask them to include your link on their pages. Contact other businesses that you partner with and offer to link to them if they’ll do the same for you. You might also consider searching for your competition and seeing where they are linked—then see if you can get a link on the same pages. Remember the old adage that word of mouth is the best form of advertising? That holds true online. In fact, Google places great emphasis on reviews, especially the reviews on your Google My Business page. Getting reviews is as simple as asking for them, and then making it easy to post reviews. Many business owners avoid reviews because they are afraid that negative reviews will find their way onto a site. Negative reviews are going to happen, whether you offer the opportunity as a part of your site or page or not. That’s not necessarily a bad thing. It could actually be a golden opportunity. If something negative does come up in a review, address the problem and then fix it. Often, the reviewer will post again—this time with a positive note—if you provide excellent service and make things right. Visitors to your site will be impressed not only at your open honesty, but also at your customer service. All of these reviews equal exposure, which increases your ranking. And it’s not just Google My Business reviews or reviews on your site that Google is interested in. All reviews help your rankings. Sites like Yelp, TripAdvisor, Angie’s List, Glassdoor, and on and on all help build your online presence, helping to push you to the top of the list. Invest time in managing these reviews and you’ll see the dividends. Think about it: where do most people do their internet searches? They aren’t racing home or to a local internet café. They’re reaching for their pockets to pull out their phones. Google recognizes this and, since 2016, has focused on mobile-first indexing. What does that mean? Google primarily crawls the mobile version of websites first rather than desktop versions. If you want to move to the front of the line, make sure that your site is one of the first searched by being mobile friendly. While these may not be the formal “reviews” other sites offer, social media sites like Facebook and Twitter still factor into your ranking. People communicate on these sites, and that includes sharing experiences at or with different businesses, especially local businesses. Google takes that into account. If people are talking about your business on social media, then your prominence ranking will be elevated. Creating a social media presence, and then taking time to keep it fresh and to engage with others, will positively boost your ranking. After all, the best place to advertise is where people are, and millions of people are on social media at any given moment. enough, adding photos is a suggestion that comes from Google’s help article “Improve your local ranking on Google.” Here’s how it works. Photos are used to showcase your products and services. They also appear on your Google+ page. When people do a search for a product or service, they’ll see those photos show up, helping them to recognize what they’re looking for, and recognize your business. Besides, if Google recommends adding photos, and Google controls the rankings, it’s a good idea to follow their advice. Put simply, content is king. Recent years have seen a shift from keyword-focused searches to relevant content searches. As Google’s algorithm continues to learn and grow, relevant content will become increasingly important. As is, Google is already wising up to keyword-flooded pages. If you want your local rankings to improve, it’s not just a matter of using keywords over and over again. You need quality, comprehensive content. Content plays a role in all of the previous points as well. When visitors do come to your site, they want to know that you know what you’re doing. Articles and posts that force the use of keywords are easily detectable, just as are articles that simply put out fluff and pointless drivel. Establish yourself as an expert through your content. When you do, you’ll see your name appearing as a citation on other sites, and you’ll see more backlinks. Reviews will also change as people start talking about and sharing what they learned from you. All of this will boost your prominence, and we already know that is one of the three top factors of boosting your ranking. While the length of an article will be determined by its topic and purpose, it does appear that the amount of a page’s content is important in terms of rankings. So make sure to post quality content for your visitors to read. With stiffer competition to make it onto the local rankings, you need to stack the deck in your favor. Addressing these 10 suggestions will set you on the path of doing just that. James is a hybrid between a technology enthusiast and a wood gnome. When he’s not doing SEO audits, putting together proposals, or thinking of how he can keep his clients ahead of the curve, you can find him wandering around the woods looking for a free meal.James prides himself on his communication skills—which have proved essential time and again to envision and design solutions that provide his clients a robust online presence.Today he and a group of Web designers, content developers, and SEO gurus work together to ensure websites for businesses remain competitive in today’s ever-changing market. tom on The Anti-Google Movement?